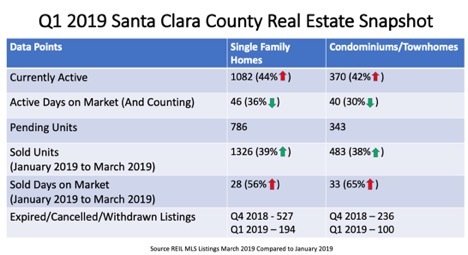 2019 has started off with the market attempting a recovery from a cruel summer and winter real estate market for especially for Sellers last year. Buyers are generally out and about, although they seem concerned and wondering if the market will drop further. However, in the past few weeks we have seen an uptick in Buyers actually making offers and getting into contract. Let us dive deeper in the various dimensions of this new market in equilibrium. More homes came on the market in the Q1 than in Q4 2018. This is not surprising given the holidays months Sellers are less willing to go on market during this time. Interesting statistics are the amount of homes taken off the market in Q4 2018 which has added to the inventory levels as they were re-listed this year, further increasing the available inventory on the market. The good news is that Buyers are purchasing and working on clearing out the existing inventory of homes. Sold units have increased since last quarter but the days on market have increased by over double, in short homes are taking longer to sell. We anticipate inventory levels to continue to rise as we approach the summer months. On a Macro level there are many factors that continue to contribute to the fluctuation of Real Estate; such as Interest Rates, the NASDAQ index and the Trade War with China. The Federal Reserve has officially announced that they do not plan to raise interest this year. In fact mortgage rates have seen a decline since. Many of our clients have refinanced their loans and those with liquid cash or investments in major banks can take advantage of further mortgage rate reductions as well. There has not been substantial movement on the Trade War with China. The key movement has been the recovery in the stock market, specifically the Technology rich NASDAQ, which has recovered nicely from the low point in December. Lfyt went IPO on Friday and projections are that Uber (filed in December), Slack (filed in February), Pinterest (filed in March), Postmates (filed in February) and Zoom (filed in March) are the next on deck. With the exception of Zoom (based out of San Jose), all of these companies are based in San Francisco. What this means is that the wealth will be centered in San Francisco, the second tier will likely be homes on the Peninsula for families looking for better school districts and lastly the third tier will be the Southbay for those that commute to the city or those with a spouse that is based out of the Southbay. Remember, when a company IPO’s there is typically a 6-month lockout period before employees are allowed to sell their shares. It likely won’t be until late this year to early next year before the liquidity will actually be realized in our real estate markets. 2020 will shape up to be an interesting year where likely all of this liquidity may actually be invested into the Real Estate market. As we are coming off peak of the last gold rush both in housing and in stocks, many are taking a step back and re-evaluating the Silicon Valley financial and physical impact on their lives. What many outsiders fail to understand, is that the Silicon Valley is a constant grind, pure hard work and full of stress to make ends meet. There are frequent choices between working on the next innovation and trading off ones’ health and time to work verses time with their families. The sheer number of people in the Bay Area has taxed the infrastructure causing horrid traffic issues. Due to the high cost of housing, many are pushing 3 or more hours just on the commute to get to the office. Due to these factors some have chosen to leave the Bay Area in search of better work life balance and more affordable housing. 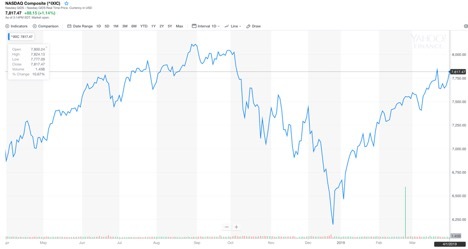 With lower interest rates, a rebound in the stock market and more inventory, the market is trying to jumpstart itself from a brutal latter half of 2018. Though the market is more balanced Buyers are still in the driver’s seat. Buyers are looking for move-in ready homes that require little to no work, are generally not interested in aggressive overbidding (except exceptional homes) and are not in a hurry and taking their time. On the Selling side, Seller must let go of Q2 2018 prices which was the peak of the market and be ready for longer days on the market and be ready to negotiate in order to get the home sold. We do anticipate more and more inventory to come on line as is typical in the summer months which means more competition for Sellers and more choices for Buyers. We are hoping you are enjoying the upcoming months of sunshine! Reach out to us at alan@alanwangrealty.com (408)313-4352 so that we can analyze your specific real estate situations!